An unnamed Asian country will be the JF-17s first export destination. The Sino-Pakistan jointly developed JF-17 Thunder fighter jet has its first confirmed foreign buyer, Flightglobal reports. “A contract has been signed with an Asian country,” stated Air Commodore Khalid Mahmood, head of sales and marketing for the Pakistan Aeronautical Complex/Chengdu Aircraft Industry Corporation (PAC/CAC) JF-17 Thunder combat aircraft, at the biennially held Paris Air Show yesterday. Khalid refused to name the country. Nor did he specify the number of planes to be sold, although he stated that deliveries will begin in 2017. He did, however, emphasize that 11 other countries have shown interest in acquiring the multirole fighter aircraft. 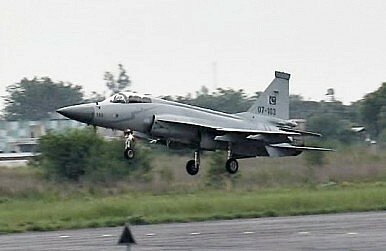 Numerous air forces are toying with the idea of purchasing the JF-17, and the media has floated more than a dozen potential export destinations, including Argentina, Bangladesh, Bulgaria (see: “Pakistan and China May Finally Have a JF-17 Buyer”), Myanmar, Nigeria, the Philippines, Venezuela and Zimbabwe. As of now, the Pakistani Air Force (PAF) is the only one to operate the aircraft. So far, the (PAF) has received 50 Block I planes, and is scheduled to receive 16 Block-II JF-17s annually over the next few years. The plane is manufactured at the Pakistan Aeronautical Complex (PAC) west of Islamabad, which has the capacity to produce 25 aircraft per year, according to the head of Pakistan Aeronautical Complex, Air Marshal Javaid Ahmad. Pakistan produces 58 percent of the airframe and China 42 percent respectively, Flightglobal notes. However, as I reported back in April of this year (see: “China Will Supply Pakistan With 110 New JF-17s”), Pakistan’s military aircraft industry cannot keep up with domestic demand for new planes. Consequently, it had to order 110 additional JF-17 aircraft from China, which calls into question the true export capacity of Islamabad’s aircraft industry. It has seven underwing/fuselage hardpoints, and is equipped with an internal GSh-23-2 twin-barrel cannon. Weapon options include up to four PL-5, -7, -8 or -9 short-range air-to-air missiles (AAMs) or four PL-12/SD-10B medium-range AAMs; two C-802A anti-ship missiles; two anti-radiation missiles; five 500 kg bombs; twin launchers for up to eight 250 kg, MK-20, GBU-12 or anti-runway bombs; single 1,000 kg bomb or GBU-10; or up to three mission pods. Is This Country the Sino-Pak JF-17 Fighter’s First Customer? The mystery continues: one media source claims that the JF-17 has been sold, another denies it.